Anna is responsible for the overall management of the WGI TSU as well as providing scientific support to the WGI Co-Chairs and Bureau in the preparation and production of the WGI products through the scoping, drafting, review, approval/acceptance, and publication processes. Main activities include the oversight of the preparation of the Special Report on Global Warming of 1.5°C and the Working Group I Sixth Assessment report (WGI AR6). Anna also provides scientific support to the preparation of the Special Report on Ocean and Cryosphere in a Changing Climate (SROCC). As part of the AR6, Anna supports the coordination of climate change scenarios across the IPCC Working Groups. Other activities include coordinating the preparation of SPM visuals with information designers and cognitive scientists and fostering the long-term curation of open source software for figures and data used within the WGI AR6. Anna supports the WGI Co-Chairs in the IPCC Executive Committee as an advisory member, represents WGI on the IPCC Communications Action Team and IPCC Operations Action Team, supports WGI at meetings of the IPCC Financial Task Team as well as at IPCC Bureau and Panel Sessions. She is a member of the IPCC Gender Task Group. 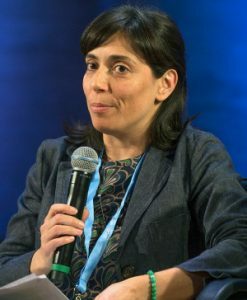 Prior to working at the IPCC WGI TSU, Anna was Deputy Director of the CLIVAR Project of the World Climate Research Programme, working on coordinated ocean and climate modelling, climate dynamics and climate extremes activities. Anna holds a Ph.D. in Oceanography.